The government is appealing against Thursday's ruling to the Supreme Court - all 11 judges are due to hear the case in early December. The prime minister called Mr Juncker and Mrs Merkel on Friday morning. Her spokesman said she told them the government was "disappointed" at Thursday's court ruling but that "the focus of the government is on the Supreme Court case. We are confident of winning that case and proceeding with Article 50". If it loses that appeal, it is expected that the government will have to publish some form of new law for MPs - and the House of Lords - to vote on. But former deputy prime minister Nick Clegg - now the Lib Dems' Europe spokesman - said his party would seek to join with others "in both the House of Commons and the House of Lords to amend the legislation" to tell the government to pursue a "soft Brexit" that would keep the UK within the EU's single market. The government's appeal is expected to be heard in early December by the full Supreme Court - 11 judges - for the first time in its history. The judgement may not be handed down until January. If the appeal fails, it is thought the government will then have to bring forward legislation - which would have to be approved by both Houses of Parliament. The bill could be subject to amendments. MPs and peers may push for more details of the government's negotiating strategy or possibly for a second referendum. The government wants to trigger Article 50 by the end of March 2017 so any legislation would need to be approved by then if the timetable is not to be pushed back. "These are fundamental issues which, of course, as part of this process need to be brought before MPs, and MPs should feel free to scrutinise them," he said. "And if they believe that the government is pursuing an unnecessarily hard, in other words an unnecessarily self-harming version of Brexit, then of course MPs should be free to reject that." But former Conservative cabinet minister Theresa Villiers told the programme: "Frankly I think it would be a constitutional outrage if unelected Liberal Democrat peers were to stand in the way of implementing the clear result of a referendum in which 33 million people took part." 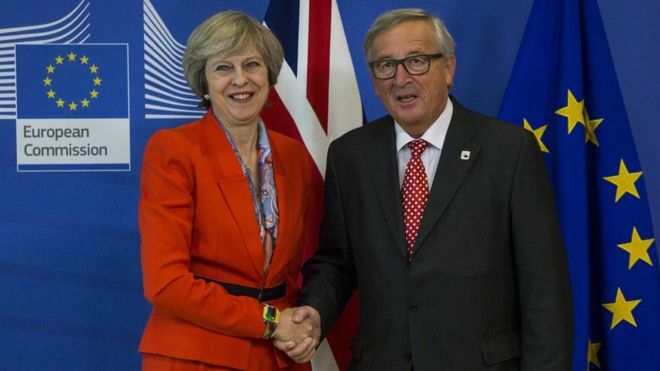 The government has argued that it cannot "show its hand in detail" ahead of negotiations with 27 other EU member states, despite calls from MPs to clarify her plans. Communities Secretary Sajid Javid told BBC One's Question Time that the ruling by the High Court was a "clear attempt to frustrate the will of the British people" despite a "very, very clear" result from the EU referendum. For Labour, shadow foreign secretary Emily Thornberry said that while she thought "that in the end Parliament will vote for Article 50 to be triggered" the judgement meant the government would have to give MPs "some basic terms on which they are going to negotiate Brexit". And Conservative peer Lady Wheatcroft told BBC Radio 4's Today she was willing to table an amendment to future legislation to delay the Brexit process, saying it was "only right to delay triggering Article 50 until we have a clearer idea of what it actually entails". However Labour MP Lisa Nandy told Question Time: "Britain is leaving the EU and whether or not Parliament has to vote to trigger Article 50, this will happen because, in reality, there are no more than a handful of parliamentarians who would seek to block that decision." The prime minister's spokeswoman has played down suggestions that Mrs May may call an early general election if she cannot get Parliamentary support, saying that the prime minister believed "there shouldn't be an election until 2020 and that remains her view". The government had argued it could use ancient prerogative powers to give effect "to the will of the people". Speaking to the BBC's Daily Politics, UKIP leadership contender Suzanne Evans said the line was being crossed by "increasingly politically active" judges. "Judges are allowing pressure groups and campaigners to bring cases for judicial review and making rulings which would not stand up to scrutiny at the ballot box," she said.